Can You Remove Walls in a Mobile Home? One of the most popular questions we get in our Facebook group, Mobile Home Living: Remodels and Repairs are about removing walls in mobile homes. Many manufactured homes have half pony walls, weirdly designed built-ins, and oddly angled walls that separate living areas. Removing walls in mobile homes depend on several variables like what type of construction your home has and your layout. Another important variable is how much money you want to spend, or how bad do you want the wall removed? In reality, anything is possible if you want it bad enough but sometimes the cost and potential long term side effects are just too much. Knowing which walls are load bearing is vital to know whether you can remove it. In this article, we will cover how walls are built, construction lingo, mobile home construction, and how to remove a wall. Before we begin, please check out our article, How Manufactured Homes are Constructed, to learn more about the construction and anatomy of interior and exterior walls, ceilings, and flooring. Before removing a wall in a mobile home you’ll need to understand what you are working with and how they are constructed. In a single wide mobile home, there are typically very few load-bearing interior walls. In site-built construction, a wall that runs perpendicular to the roof joists may be carrying weight but that isn’t always the case with mobile homes because of their construction. It’s still a very good rule to go by. A manufactured home’s stability and integrity are typically derived from the roof and the weight is carried on the exterior walls, down to the outriggers on the chassis. This is a concept called integrated engineering. Some builders describe their integrated engineering as roof-down construction, meaning the mobile home’s structural integrity is derived from the roof. It makes sense because the home’s weight sits on a steel chassis and that chassis is what they use to pull the home so to create the strongest ‘box’ they need to focus on the roof first. Imagine a spiderweb. Alone, one single thread does nothing for the spider but a bunch of threads together makes a strong home. The roof joists and side walls create the threads for a mobile home. There are many ways for manufactured home builders to design their ‘web’ and each builder does it a bit differently. That’s why finding information on your exact home model’s construction is nearly impossible. Understanding how your manufactured home was constructed is tricky because builders rarely, if ever, release engineering or construction information for their homes. The manufactured housing industry isn’t known for its customer service. We can barely get ahold of an owner’s manual for a recent manufactured home model so finding actual load-bearing information is next to impossible. We’ve been collecting mobile home manuals from various builders and models. If you are looking for a mobile home manual click here to see our list and download what you need. Only the manufacturer that you purchased the home from can give you the schematics and load-bearing information. Don’t be afraid to call them and ask questions. If your home builder is no longer in business you are probably out of luck, unfortunately. The laminate floor is under the interior walls and tub in the bathroom. This manufacturer utilizes top and bottom horizontal studs in the interior walls. All that is useful information and if you can learn that same kind of information about your own home you’ll be well prepared to tackle removing a wall in a mobile home. The roof and the perimeter of the home are not added until the very end because none of the interior walls typically hold any of the roof’s weight. Once all exterior walls are placed the roof is laid and it creates a perfectly strong and structurally sound home that can be pulled on the highway going 55mph! A double wide is essentially just two single wides joined together on site. The center line is called the marriage line. As long as you’re not modifying the marriage line, load-bearing interior walls, or the exterior walls and corners you shouldn’t have any issues when removing walls. In other words, remove all the partition walls you want but leave the structural walls alone. One example that you need to look for is if your ceiling changes the height or goes from one height to another on the same wall. That could signify that a shear or load bearing wall is being utilized. Each company did things just a little different and I’m painting with a broad stroke here. Leave the Marriage Line Alone! We always advise that mobile homeowners leave their marriage lines alone. Incorrectly modifying the marriage line of a double wide can create roof leaks, weakened structural integrity, and several other very expensive issues. Using a beam and span support system to replace a load-bearing wall is possible but this is when things start getting serious and you need to have a professional contractor and a licensed engineer involved. In our experience, modifications to marriage lines simply aren’t worth the potential problems that may occur in the future. If you are removing an interior wall there is an order in which you should do it. This ensures you don’t start busting through a wall and find out that it is load/shear bearing or full of juicy wires. Turn off the electricity in both the room you are in and the neighboring rooms. If possible, turn the breaker off on the entire side of the home you’re working on. If you’re near a bathroom or kitchen or there’s a slight possibility that there could be a pipe anywhere close to where your working, turn the water off as well. Don’t forget about the ventilation pipes to your home’s plumbing system! Next, remove the battens or strips that cover the seams where your wallboards meet. You can read how to do that here. Also, remove the base, chair rail, or crown molding from the wall you are removing. Peel back the flooring away from the wall if possible. If your home has the walls on top of the floor covering you will need to cut it away. This step sounds odd but it shouldn’t be skipped. Use the side of your fist and knock around the wall. Start at the end and work your way inward. You’re doing this for 2 reasons: to help you locate the studs and to help loosen the glue that is holding the wallboard to the studs. Once you know there are no wires or pipes you can use a new blade to cut through the wallboard. No studs or framing should be touched yet. 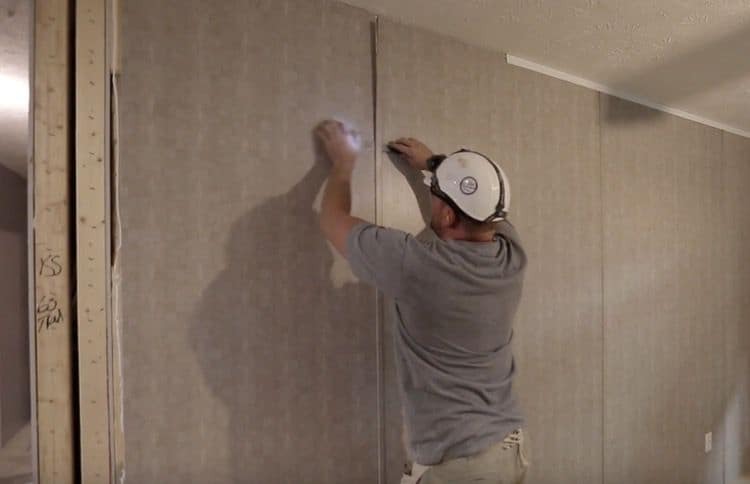 Cut the wallboard into a small rectangle starting at the top corner of the wall first will allow you to check for signs that the wall is load-bearing without damage. If you think you have a load-bearing wall you should stop and consult an engineer before continuing the project. If there are no signs of a load-bearing wall cut the wallboard across the middle. Use your hand or a crowbar or hammer to gently pull the rest of the paneling away from the framing. Do not alter or harm the framing within the wall. Go a little bit at a time to ensure there are no wires or pipes. If all is clear go to the other side of the wall and remove the paneling/wallboard from that side. Now that the wallboard has been removed from both sides of the wall you will need to get the glue loosened and the staples and nails out of the bottom plate and the top plate of the wall frame. At this point, you can take a Sawzall and cut the studs midway between the floor and ceiling. You could also cut the vertical stud from the top plate and bottom plate – it’s really up to you. I think by leaving the vertical studs on the top and bottom plates you allow yourself a little more leverage to loosen them from the ceiling and floor. Of course, you could just kick them out but a more delicate touch may be less damaging. You have to figure out how to get those studs away from the ceiling and/or floor without causing too much damage. You don’t want to scar the ceiling. Ceiling panels are a pain to replace in manufactured homes! Having a sound plan will eliminate surprises. How are you going to handle the ceiling? There will likely be evidence that a wall was once there. You can paint or spackle it over or use trim of some sort. Patching the ceiling will be difficult if it isn’t sheetrock. The ceiling panels used in manufactured homes are hard to find and transport. How are you going to handle the flooring? If you are installing new floor covering you’re fine but patching is difficult with many types of covering. Read about mobile home flooring options here. Of course, by removing a wall you’re probably going to be remodeling the room so you already have a good idea of how you’re going to handle these issues. Related: Some Questions about Removing Walls in a Mobile Home. That’s it! You have successfully removed a wall in your mobile home! 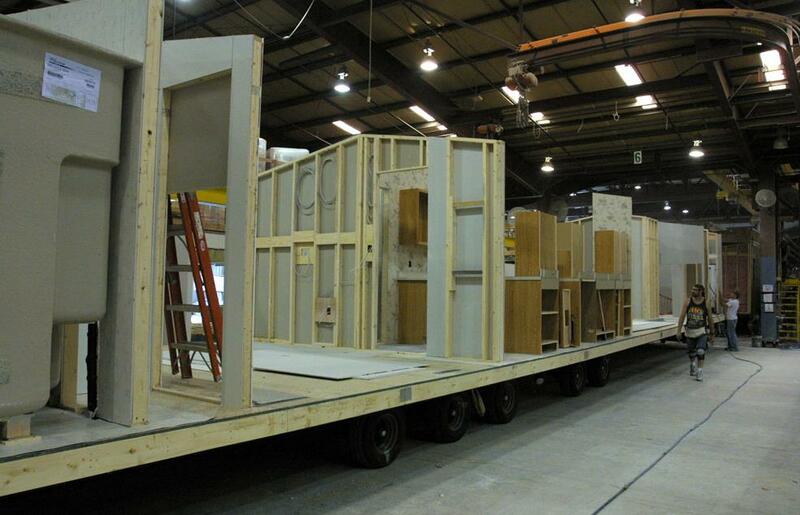 Remember, every manufactured home is built differently, therefore, removing a wall in your home may not be possible. This article should not be considered professional advice. Please consult a professional before attempting a major modification. If you can’t identify it by its proper name you shouldn’t remove it. If you’ve removed a wall in your mobile home please comment about your experience below. Every little bit we can share can help someone out there get one step closer to their dream home and that’s a pretty awesome thing to help someone do. Updated April 13, 2019. Originally Published in 2014. I would like to remodel my double wide with two french doors in my livingroom. Is it possible to cut two openings in the exterior of my home as long as it’s framed properly or will this decrease the strength of my home. We plan to hiring a professional to do this job, not a DIY. If it isn’t the marriage wall, you should be OK. Modifying marriage walls is tricky. You’ll def need to hire a pro that understands the framing needed. Best of luck! I design Park Model RV’s. My area of Arizona is Tucson and there is a LOT of mobiles here that can use both updating and remodel. I do a series of books with Blurb publishing that I hoped to change how the industry spits out this product but after 11 factory tours coast to coast I have given up on trying to get them to change. I have worked on the factory floor so I know how and what systems are used and remodel is generally MUCH easier than stick built. There are exceptions but nothing a competent builder can not overcome with ease. Finding someone with vision is the big issue. I would love to chat with you. Park models have SO MUCH potential to be the affordable tiny home we all want but I don’t understand why they insist on a RV classification. Can you please email me at [email protected]? I’d love to pick your brain a bit. You talk about removing interior closets. I want to remove the interior clothes and kitchen pantry closets that are separated by a common wall and also remove the wall in the kitchen that connects them. Can I do that without touching the marriage wall? Removing the closets will obviously enlarge the kitchen. I should also mention that I removed the old cabinets and want to install new flooring that continues from the living room. Is there any way to remove part of the marriage wall and replace it with a post or beam? It all depends on the layout of your home. Are these closet walls a part of the marriage line? If so, you should leave it alone – the cost and the future issues you would incur is just not worth it. The new cabinets and flooring are a great way to update your home so def go with that. I’m just not a fan of anyone touching the marriage wall regardless of reason – you’ll never be able to move the home again and you’re essentially disrupting the entire structural integrity of the home. I like to remove a section of my marriage wall that separates the living room from dining room. It has a 8” or so header in the opening lid like to leave that and install a column under it. Is this feasible? Good question! To be honest, I’m dead against any kind of modification to a marriage line. It’s absolutely possible to do what you want but every time I’ve seen a home with any kind of mod to the marriage wall an issue of some sort eventually happens (sagging roofs, leaks, etc.). It’s just to big a chance to take in my opinion. Sorry to be the Debbie-downer! I’d love to see pictures of your process. You wouldn’t happen to have any would you? I love to see people make their homes better suit their needs! Thanks for reading! Unfortunately, finding VOG wall and ceiling panels is very difficult. However, you are in TX so you have a better shot at this than anyone because you have 19 manufactured home builders in your state and that’s who I would call first. My second move would be mobile home supply stores. No one wants to ship them because they are so easily damaged but if you can get a store to work with you and be your delivery point you may be able to get some. Removing counters isn’t as difficult as a wall but it’s not as easy as most think. You need to consider electrical and plumbing first. Subfloors and joists will also need to be considered (patching any holes, etc). You will probably have scars on your flooring and any connecting walls, too. A big open floor plan is a great thing to have these days – everyone wants them so it may make selling your home easier in the future. Second question: You mentioned carpet, laminate and a ‘floating floor’ <— what is that? Also, when it comes to upgrading insulation, what have you found most effective? Third question: I have a collection of favorite books; while planning my remodel, built in shelves are an item I want to discuss with my designer and contractor. Have you seen this done nicely anywhere? Got any photos to share? Thank you for answering my questions! I am brand new here, and I am so glad I found mobilehomeliving.org. I appreciate the diagrams, photos and lists. This is clearly a work of love. It’s a great idea to replace VOG with sheetrock or XRoc, or whatever brand you choose. You can rid of the strips that cover the seams of the VOG. The different terms is a common problem because different parts of the country use different names for products. In WV, laminate flooring is also called floating floor and I use both terms interchangeably. It’s the flooring that interlocks together to create a single plane and the perimeter is covered with trim. It’s a good DIY product. As far as built-ins, I’m kinda against them. You never know when you’ll want to change the space around and built-ins are pretty expensive. I’d go with bookshelves or braces and boards or floating shelves. So glad you found us! Please take photos of your project! Hi Bruce, you can absolutely build an addition to your home. You will just need to build the foundation separately. Then you’ll just seal the roof, siding, and door between the addition and the home. Here’s an article called Building Mobile Home Additions that may help. Hi Crystal , great site! My husband and I are remodeling and wanted to open up the kitchen by removing the center and connecting wall. We figured it might have to stay there or maybe do an Arch or Columns ( spread a little farther apart) Can I email you a picture? Any thoughts of what we can do ? Greatly appreciate! Hi Mr. and Mrs. Guzman! I sent ya’ll an email yesterday – Best of luck! I’m not a big fan of doing anything to a marriage line but I’ve seen some gorgeous archways done. As long as pro is involved and you remove the absolute least amount of framing while reinforcing it back you’d probably be OK. I still get nervous just thinking about it, though. Thanks for reading! Congratulations! I would love to have a 16′ wide home! In most single wides all your integrity is derived from the perimeter walls. That means most interior walls are not load-bearing. I can’t give tell you for sure if your wall is load-bearing but in most cases, single wides can be modified fairly easily. Hope that helps a little! Best of luck! I have a 2002 26×80 Clayton. I was wanting to replace the sliding glass door with a patio door white one of the door opening not both. Floor to ceiling I only have 84 inches and the door is 79.5 inches tall. Could I use a 4 inch steel I-beam as a header? You will usually need to frame out new doors because the sizes are not standard industry sizes. I’m not really familiar with steel beams but I’ve seen a ton of regular ole lumber used to frame-out doors and windows. Sorry! You’ll want to use new sheetrock for the new wall. Removing the panels without damage is difficult. Plus, sheetrock is a lot easier to deal with over the VOG panels (you can patch the seams better because sheetrock has a slant edge that helps to smooth the mud. VOG mobile home panels are just straight edge so it’s more difficult to smooth the seams and paint). I removed the carpet in some of my rooms in a 1998 Palm Harbor double wide mobile home and put down self stick vinyl tiles on the wood floor. Some of the tiles have separated and have a small line between them, other spaces are okay. What causes this problem. In 2 other rooms I purchased a more expensive tile and there does not seem to be a problem there. Thank you for your help. If I had to guess, it was probably the glue. The more affordable brands don’t use the best adhesive. It just didn’t make a good bond to the surface. You can find a vinyl tile adhesive and put them back pretty easily. Just so everyone knows that may not know, an early 90s model Palm Harbor 16’x80′ has 2″x8″ floor hoist! I was really surprised! Can a window on the end of a single wide mobile home be removed and the opening enlarged to add an exterior door? Yep! All you need is the proper framing. My husband & I are downsizing from a 1750 sq ft frame home possibly to an older mobile home located near (500’) from a lake. The date on the real estate listing says the single wide home was built in 1981. We would like to re-configure the floor plan. I have been reading on your site about moving walls on a mobile home. The statement was made in the article, “In a single wide, with recent construction methods, there are no load bearing interior walls.” What classifies a recent construction method? Unfortunately, I do not know the manufacturer. We have not been inside the home yet, but are considering buying the home & renovating it to our specifications. We are not ‘flippers’, but have renovated several large projects over the years- restaurants, B&B, condo, our own home that was built in 1933, so we feel somewhat qualified to make the changes, even though we have never taken on a mobile home project. What should we know going in? You should be fine as there are rarely any load-bearing walls in a single wide home. The way they are designed and constructed is amazing – the integrity is derived completely different from a site built home so all the load goes to the exterior walls. we have a 1978 Fuqua double wide with 1 half having vaulted ceilings. we are remodeling, and removed all the fake wood paneling to install drywall. interior framework is 2×3, and exterior framework is 2×4. we also decided to frame in a new window where there isn’t one. If I frame it in as a load bearing wall (supporting it during the re-framing, and installing 2×6 header, king and jack studs, etc), should I expect to see problems in the future? I am following tutorials online about framing in a window in a load bearing wall. I haven’t cut any of the walls framework out yet. It sounds like you know what you are doing and have a good handle on the research. As long as you create a path for the structure to continue its load bearing capabilities you should be fine. Is it possible to remove the chassis of a 1972 14 x 68 General mobile home and replace with manufactured wood joists . I realize that this is a huge project but can it be done and any suggestions would be appreciated. I suppose anything is possible but I wouldn’t recommend it. Mobile homes are built on cambered chassis and get their structural integrity differently from a site-built home (top down instead of bottom up). The chassis is slightly curved to properly hold the weight for that model’s design and weight distribution. By modifying it you are risking some serious structural integrity. You can do just about anything you want with the chassis in place- raise the home, add a basement under it, etc. I’d leave it and work it into your plans – it’ll be a lot less trouble. We have a 1973 Festival double wide 2 bedroom 2 bath. My question is what is the interior and exterior construction? We were told it was 1×2 and i thought all walls were 2×4 wall construction. I’m pretty sure some homes were built with 2×4’s on the exterior walls, where all the load is held, and 1×2’s for the interior walls. And this doesn’t mean your home is inferior to any others – it simply means it has thinner walls. Back in the early 1970’s homes weren’t ‘green’ and weight and cost were the main issues. Thinner walls helped both cost and weight. You really seem to know your stuff, glad to have found your site. I have an old ’73 double wide that I’m tearing apart and I’m thinking about using the old 10″ i-beams that run underneath the frame to use as a long beam on the outside edge of a porch cover that I want to build for my new double wide. Less posts!! The guys at the permitting office are giving me grief, saying I need to know what the grade is on that before they’ll approve my plans. Any ideas? Should I be looking for a stamp on it that’ll declare the grade? Or was there a standard grade used for all U.S. made double wides from ’73? Any help you could provide would be greatly appreciated. Thanks! YOU are the one that sounds like they know their stuff! Here’s what I think I know: All those steel beams under a manufactured home are cambered, meaning they are formed specifically to distribute and hold the weight for that home’s specific design or layout. They each have slight bows, none are stick straight. The inspector could have been talking about that. Then again, when I hear the words grade I think of the grade of the land (or maybe the pitch of a roof? I’ve heard grade used instead of pitch). Sorry, I can’t be much help! Let me know how it goes – I’m interested in the results. Hello. I have a 3bed 2bath1970s Tidwell manufactured home. My husband and I are looking to do some remodeling. As we are on a budget we are starting with kitchen and bathroom. My question lies in the kitchen, there is this weird console bar area, with mirrors. We want to remove this area to open the kitchen up to the living room. Any tips? There is an electrical outlet attached. Another question, we would like to remove the Intertherm furnace in the kitchen/ hall area for more space, as we do not heat or cool with it. Is this possible? I have a love-hate relationship with those mirrored walls! On one hand, mirrors really do make a room seem larger but on the other hand, some styles of mirrors date the home terribly. Removing the walls with the mirrors all depends on whether the wall is load-bearing or not. If it’s a single wide and the wall is not an exterior wall you should be fine, it’s likely not a load bearing wall (single wides do not have many load-bearing interior walls). If it’s a double wide and the wall is not on the marriage line or an exterior wall you should be able to remove it assuming it’s not a load-bearing wall. Of course, I’m no expert. You will need to have an electrician deal with the wiring but it shouldn’t take them long to do it. The furnace can be removed but it’s a little more complex than just taking the unit out. The walls you want to remove cannot be on the marriage line or load-bearing and you will need to properly seal/remove the vents, the electrical, etc. The ceiling is usually a bit complicated because you will have to repair the ceiling after the walls are removed (especially if you remove a couple of walls in a small space). Plan on replacing the whole ceiling panel instead of just a small section. I’ve seen furnaces removed a few times and every time the job ended up taking a lot longer than planned. Sealing the vents is a big job, too. Hope that helps a little. I don’t want to scare you but there’s a bit more to the removal of a heating/cooling unit than just removing the unit itself. Best of luck – let me know how it goes and if you have any more questions please feel free to ask! This is a wonderful site! I do have a question. I have a wall in my double-wide that runs in between my living room and kitchen- approx. 13 ft. At the end of the wall, on either side, the wall “doubles” where the two halves of the double-wide come together; however, in that 13 foot section it is just one half of the house. Would this still be a load bearing wall? I can send pictures if that would help. Yes, most likely. If it’s running down the middle of your home it’s probably your marriage line. You can send me a picture if you want (my email is [email protected]). I also have a question about a well that is the “marriage line” mine is a small section of wall that has a window type opening so you can see through from the livingroom to the dining room. I am wondering if I can put to support post since it would be a very large area to only put 1 post (I am assuming) and remove this marriage wall? Or is there a way to remove the marriage wall completely in my living room? Let me say that you really should consult an engineer. With that said, you’ll want to add a support beam when doing any kind of modification to a marriage line. There’s a lot of engineering involved in marriage lines (seals, connectors, etc). so I’m not a real big fan of doing anything that doesn’t absolutely have to be done. Perhaps you could leave the studs in and just update the middle of the wall with shelving where the windows are? That would be a lot easier and cheaper and no structural mods will be needed. Best of luck! Let me know how you decide to go! I have a 2001 Four Seasons double wide. We had it put onto a basement when we moved it in. The house was not built with basement access (obviously) but I would love to have access to my basement from inside. I’ve had some tell me it could be done and others say no. As far as I can figure, the company has gone out of business, so I can’t contact them to ask. We did have our new furnace put downstairs instead of the little closet room off the laundry, and when my water heater goes the new one will hopefully go downstairs too, and free up some more space in the utility room for storage. Do you think it is feasible to have basement access from inside the house? I hate having to go outside around to the side of the house to get into the basement. It’s been done many times! Because manufactured homes derive the structural integrity from the roof opening a hole is not a huge problem though it does need to be well-planned; the floor joists will need reinforced around your opening and you cannot modify the chassis so placement is important. Check your local codes and regulations first – there may be laws in your state/county that could complicate the project. I have just bought a mobile home exactly the same set up except my basement access is a beautiful wrought iron staircase located within the living rooms. Hi Emily, thank you for your information. I was wondering I have a 1973, 12 X 50, mobile home. From what I read there isn’t any load bearing walls in a home this size. Am I correct? I have 2 small bedrooms and a small family room, I would like to take out the wall between family room and 1st bedroom so I can have a larger family room. Thank you for your time. In most situations, a single wide will only have exterior load-bearing walls but every home is different so I can’t just to tell you there is none. I can only tell you that your chances are good in my experience. What about taking a portion of a wall out on the marriage line, but not ruining the integrity of the groups of studs. The first of said groupings, is just after a cutout from den to kitchen. Its spanning 35 inches, so you can imagin a relatively small window. Id still like to remove as many single studs as possible, just not let my kitchen ceiling collapse! Any mods to the marriage line is asking for trouble unless you have an engineer and a highly experienced contractor involved. Manufactured homes derive 100% of their structural integrity from the roof (the very opposite of a site built home) so any changes to exterior walls of single wides (marriage line of a double wide) is a huge project. Just about every home I’ve seen with marriage line modifications suffered issues a couple of years down the line. We have a 1973 double wide (24 x 60), we want to remove a wall that runs from the marriage line toward the exterior wall (perpendicular to the marriage line). It stops 2 ft from the exterior wall and set 13 ft back from the front of the house. Is that typically load bearing? There is a bedroom and bathroom wall that runs on the marriage line, it is around 17 ft long (we are not touching this wall as we know it is load bearing). It’s hard to tell MJ. Typically, all perimeter walls for a single wide and the two sections of a double wide will be load bearing. If it’s not a perimeter wall there’s a good chance it’s not load bearing. HEY, I HAVE A 1998 MOBILE HOME IT HAS A SOLID FOUNDATION FLOORING AND ROOFING WISE, BUT I WOULD LOVE TO TAKE THOSE HOME WALLS AND GIVE IT THE NEW HOUSING LOOK THE WHOLE WALL WITH NO STRIPPING, I’M DOING EVERYTHING MYSELF CAUSE I CAN’T AFFORD TO PAY ANYBODY RIGHT NOW AND I DONT KNOW WERE TO START PLEASE HELP. quick question in general. Do I need HCD or city permit to replace the outside wall of my mobile home? It varies depending on city, county, and state. Call your local courthouse or townhall and ask them about remodeling inspections and permitting. Chances are you will need to pay the government something, especially if you are in city limits (at least that’s how it works in the states I’ve dealt with). Best of luck! Take photos for me! I’m glad I stumbled across your website! Great information! I was wondering if you could answer a question.. We are considering buying a double wide that is used, the Windows seem to have 2 in one spot.. Like if you were to open 1 window, you would have to open another..(1 on the inside, 1 on the outside) if that makes sense.. I’ve never seen this before and was wondering if you know the purpose of this. Thank you! I think you may be seeing the storm windows. They can come out in the summer but add an extra layer of thermal protection in the winter. Hi, I have a 1999 solitaire, the carpet is time to go, trying to find ab inexpensive way to put down a new floor, can I put a concrete floor in the kitchen and dinning room? Concrete is not an idea flooring material. You’re best (and cheapest) option will be the .89 cent per square foot laminate flooring at Lowe’s/Home Depot. We were able to install it in our entire home for $400. It’s simple to install, no special knowledge needed and it stands up really well against scratches. Buy 10% more than you need – the quality control is a little lax on the cheapest option. They just snap together. Leave 1/2 inch space between the flooring and the wall to allow flooring to expand and contract. I am trying to find a site about with suggestions for handicap modifications, Hallways, doors, bathrooms etc. Any suggestions? I am so glad I found you. I just purchased my 1st home – a 1973 doublewide Silvercrest 24×56 and I am going to renovate quite a bit. 1. Is it worth it to insulate? If so – can I drill holes and spray it in? 2. Do I need to remove the paneling to insulate? 3. I actually hate that stuff and will cover it but not sure about the best way (fill in holes? paint/ wainscott and texturize top half? etc). ALSO – i have had 3 different contractors give me different info about whether I can remove that yucky long wall that has the kitchen / wall oven/ cook top on one side and a bookcase on the other. IS IT ONLY A ” STRUCTURAL ENGINEER” THAT WILL KNOW? I will be reviewing my email every day waiting forward to hear from you. It is worth it too insulate but I would start by adding insulation under the home first. I wouldn’t worry too much about the side walls but if you are replacing the paneling with sheet-rock (if that’s within your budget) I would definitely spend the money on a few rolls of insulation and install it. If you are not removing the paneling I think you may want to go from the outside of the home with a spray insulation. At least, that’s how the government did it in WV while helping improve mobile homes (it was a federal grant program to increase energy efficiency in old homes and I got to watch them work a bit). If your wall is right in the center of the double wide (longways), at the marriage line, it is very likely a load bearing wall (it is) and cannot be removed. You may be able to remove the paneling and leave the studs (make them into decorative columns), to open the space up a bit but that’s about all you can do without getting the expensive guys involved (still, I have to suggest that you have a professional look over it before you do anything). Hope that helps a bit! I’m here if you have any more questions! Best of luck! Hi Crystal, we did not know and we removed the bearing wall few years ago, we ask the gay was doing the job and he said that was not a problem, instead we install a bean made with engineering wood of 22 foot long with postes on each end. But since than the house made so many noises and we don’t know what else to do. Do we have any other options, please I need your advise. After looking at your photo I received I sent you an email but I’ll answer here as well in case someone one else is interested. To be honest this is really over my head but I’m going to send it to a framing/structural contractor and see what they say. You may just need to add a post in the middle to distribute the weight better. Right now, it looks as if the weight isn’t being equally distributed – there’s too much space between the posts. Can you tell me how many feet that opening is (between the posts)? Also, could you tell me more about the noises? Have you noticed any settling (under the home)? Any piers sinking or not touching the chassis anymore? I’m thinking this wasn’t done completely wrong – at least, whoever did it understood that the beam and posts were needed – but perhaps the home has settled on one side and that’s stressing everything. How to add an interior wall to an existing older mobile home? Specifically connecting to the ceiling. You would just frame it out (depending on where your ceiling joists are), cover it with sheet rock, and trim it. It’s all looks in this situation since it won’t be a load bearing wall (or can’t be a load bearing wall). Hello Crystal, I love reading your MHL. My husband are retiring, we have single wide mobile home 86 miles outside of St. Louis, Missouri. It is stationary on six acres. It will never be moved. We are in the process of selling our home. We want to remodel the mobile home. Make a bigger living room/kitchen, take down a wall, add one for two bedrooms. We were wondering if you know of any contractors who work on mobile homes in the Missouri area? We are first time mobile home owners and we get so many different comments about how to remodel. Please help us? thank you again. Theresa Solari – Rosebud Mo. Unfortunately, I’m not familiar with any contractors outside of West Virginia. I Google searched for St. Louis mobile home supply stores and found quite a few of them (I’ll add the link below). Call them and ask for recommendations for contractors. A regular contractor that understands the state and local laws for mobile homes and knows the different construction rules is what you need. If the supply stores don’t help try your local mobile home dealers (Clayton, Skyline, Freedom, etc). Just give them a call and ask if they could refer or recommend a contractor that works on manufactured homes. Best of luck! Make sure to click on Repair on the top menu and look over the articles about hiring contractors. There’s a lot of good information there. Hey I haven’t seen any post since September so I’m not sure if this is a current thread, however if it is I have a 14×76 singlewide imperial brand from what I was told there are no labels left where they should be. I inherited the mobile home and did some work and remodeled the kitchen. There was a short wall between the living room and kitchen maybe 2′ at most I removed. At the time I figured it was just a divider wall and a place for the original cabinets to end since they were built to the wall. I was hoping to get some feedback on whether someone thinks that was a load or shear wall or just a divider. The mobile home has vaulted ceilings throughout if it makes a difference any help would be appreciated. Single wides typically do not have any load bearing interior walls. All of the exterior walls are the load bearers. You should be fine! Thanks so much! I would really need to see the layout of your home to give you any kind of answer. Typically, on double wides and triple wides it will be the exterior walls (on each section) that are load bearing. If you can send a photo to me at [email protected] I can take a look. Raising your cabinets is a great idea and will give the kitchen a lot more room. Would love to see your kitchen before and after the change! My wife and I are about to take in her handicapped nephew and I need to put a door into a room through the marriage wall. The home is a 2004 Clayton and my question is: is the marriage wall built with simply 2×4’s typically or are they doubled up? Can I install a door by double studding the door frame and installing my own header? Will that support the necessary weight? Husband and I just recently bought a 1997 single wide 14×70 mobile home. We don’t want to go too expensive. We have to replace all of the subfloor due to previous tenant having dogs that peed and pooped all over :/ What subflooring would be best to use? We also have to replace all of the drywall. Any suggestions there? Previous tenant had exterior wall removed and put in one of those windows and then door on the side of the window. The frame is rotting, also noticed part of what looks like the underneath of the mobile home board is rotting. How would I go about removing the window/door combo, or just fixing the frame around it? There is an original back door already, but they covered the inside of it up. If I want to use that one instead, how would I build a new exterior wall where the “new” door combo is? Hope I didn’t confuse too much. You can use the 4×8 OSB tongue and groove sub-flooring, that’s what we used and it’s worked great so far. You’ll need to decide on the thickness depending on your home’s construction. The drywall will probably just be a standard demo and install job. The rotting will need to be completely removed and replaced, just take the window and door out and carefully check for damage. Once you know exactly what needs to be replaced you’ll use supports and cut out the damage and frame it all back. Most of these jobs are the kind where you don’t know what you have till you’re in there but it sounds like you are taking the opportunity to get it done correctly so that you won’t have to worry about it again – that’s the way to do it! There’s a couple different ways to re-roof a manufactured home. These days, most people go with metal roofing because you don’t have to remove the existing shingles so it’s more affordable. You simply build a frame and attach the metal roof (there’s much more to it but that’s the simple explanation). You could also remove the old shingles and install new shingles. It is odd that most single wides seem to have a lack of end windows but luckily you can have windows installed just about anywhere you want! All it takes is the proper framing (king headers above the window and double headers beside them) to allow the load to be distributed properly. We were really lucking in finding a single wide with a kitchen on one end and a master bedroom on the other. Each room has windows on all 3 sides. I love it and windows really does help a smaller home seem larger. Best of luck in your new home! I’m sure you’ll get it exactly how you want it. Hi there! You suggested doing your homework (which I agree is a great idea) but all I’m coming up with is that the company who made our mobile home we just recently purchased sued a lot of people for not paying for them, and that’s about it. We have a 1973 Geer 14×70 that we’d like to take out a closet/bar/partial wall between the living room and kitchen in. Any suggestions for where I might find more information? It’s really hard to find information on mobile homes. Even the best research often comes up empty. Companies buy each other out, go bankrupt, and become part of larger companies all the time. Since your home is a single wide and you want to remove a partial wall, you should be fine. Single wides rarely have load bearing walls – all their structural integrity is derived from the exterior walls and roof. Of course, I’m no engineer but I’ve seen lots of single wides get new layouts over the years with little issue. Good luck and thanks so much for reading MHL! I’m looking to frame an interior, non-load-bearing wall with a door to close off our 19×13 Great Room in the front of our manufactured home. To do that, though, I’ll need to put that wall directly across the marriage line. I have no problem doing so, but I want to make sure that it won’t present any structural issues, other than the obvious one of making the wall so that it can be split in two if the trailer ever needs to be moved (which is not a problem). I’ve looked all over and have found no info, so I was wondering if you had any tips or suggestions. Thanks for a great site! I’m not an expert in construction but I don’t see that it would pose any issue since you’re not going to be manipulating any load bearing walls. However, you will need to take into account settling issues between the 2 sides. Should one side of the home settle further or move separately from the other side, you’ll probably have to repair cracks in the drywall and perhaps repair framing. I tried to Google search information on the issue but came up empty. The wall you’ll be adding will essentially only be a cosmetic addition, not structural, and that shouldn’t pose any extreme issues other than the 2 already mentioned. I would feel comfortable doing it in my own home if the home had been there for a few years (to account for any settling). my home was built in 1998, half the home has vaulted ceilings and the other half have flat low ceilings. Okay my questions, why aren’t all the ceilings the same through the entire house? And I want to remove the flat ceiling in the bedroom and peak it, can I do that? I have the same question,,,,half the home has vaulted ceilings and the other half have flat low ceilings. Okay my questions, why aren’t all the ceilings the same through the entire house? And I want to remove the flat ceiling in the bedroom and peak it, can I do that? I’m not exactly sure why the designers/builders chose to vault only the living spaces and not the sleeping spaces. I want to say it’s to reduce heating and cooling costs and to give the home additional bracing and structural stability (especially during transport). This is where it gets tricky. I recommend you have an engineer inspect the home before you attempt any modifications. I’ve seen that low ceilings can signify a load-bearing wall and if that’s the case, it’s best to leave it alone – things get too complicated when trying to remove load-bearing walls in a manufactured home because their structural integrity is derived differently than a site-built home (from the roof down instead of the foundation up). Thanks so much for reading MHL and asking good questions! You can use the search button on the top right (it looks like a spy glass) and type in whatever it is your interested in and it should pull all the articles up for you. We have over 300 so I think you’ll find something helpful! Good luck – if you have any specific questions I’m glad to help. To be honest, I’ve never been involved with or seen anyone install a new slab under a home that’s already been setup. I’ve only seen re-leveling and slab/tier repair. If you are having issues with leveling you should be able to find a workaround that follows code. Adding a block foundation around your home is a great way to update the appearance, but it has to be done correctly in order for the home to qualify as a permanently installed home. Just adding brick or cinder block under a home does very little for the support itself. You’ll probably want to contact a couple different installation companies and have them give you an estimate. Just make sure to get a couple different estimates and check their references before hiring anyone. If you have any more questions just let me know. Good luck and thanks so much for reading Mobile Home Living! Just take it easy on the ceiling above the wall that is coming out, it may need minor repairs anyway. I'm wanting to take down a wall in my kitchen to make one of my bedrooms a dining room I have a dining room already which I want to extend my kitchen, however the dining room is right there at the laundry and bathroom who wants to eat while being next to those rooms. I'm a big fan of the laminate flooring (floating floors) or tile. They seem to be the easiest to install and keep clean. There's a lot of choices out there though. Good luck! Sounds like you've been busy! I'm a bookshelf junkie (probably cause I'm a book junkie, too) and I would lOVE to have a 10ft bookshelf. Lucky you! 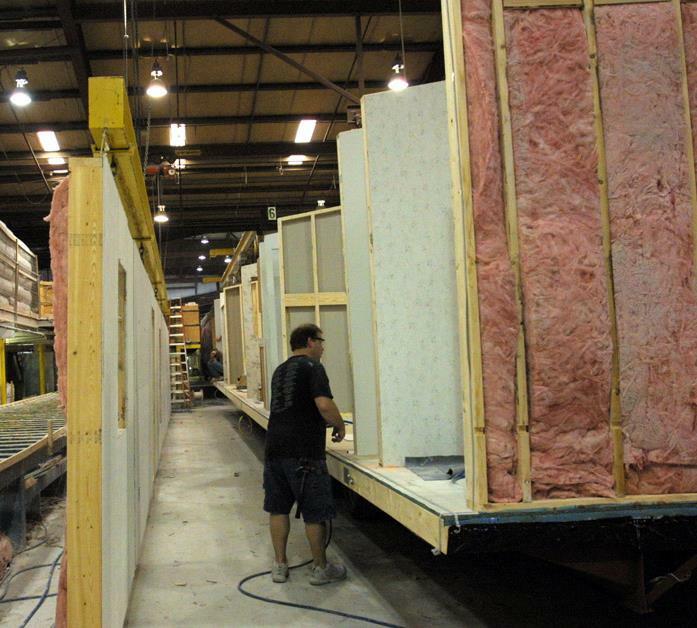 Mobile homes can be a bit naked when it comes to insulation. Small additions can really make a huge impact, too. I'd love to share your home on MMHL, I'm always looking for remodels and updates! We removed the wall between the bathroom and the guest room and are building it into one very nice bathroom. Also, in order to accommodate a wheel chair, we knocked out the interior hall walls and significantly widened the hall, building a 10 ft bookcase on the wall that encloses the bathroom. We are tearing into all the exterior walls to repair any structural damages and over-insulate like crazy. My elec bill tells me, it's working. Thank you sooo much for sharing your experience, I am planning the same project and am a wee bit frightened I might mess something up. Knowing someone else has done it gives me peace of mind. Ty, Tena! Nice article! What would you recommend to cover my floors?